Copyright © Art Scroll. Images used with permission. 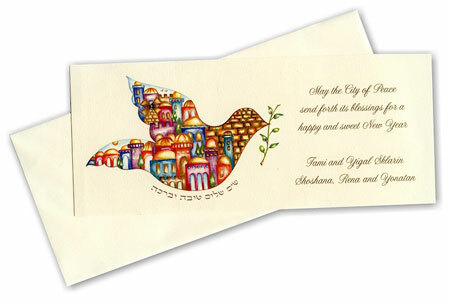 Ecru flat Jewish New Year greeting card with an elegant watercolor design of Jerusalem painted within a dove. The Hebrew greeting printed below the dove translates "Give peace, goodness and blessing." The Hebrew is pre-printed and cannot be changed or removed. The typestyle will be as shown with the sentiment you have chosen. 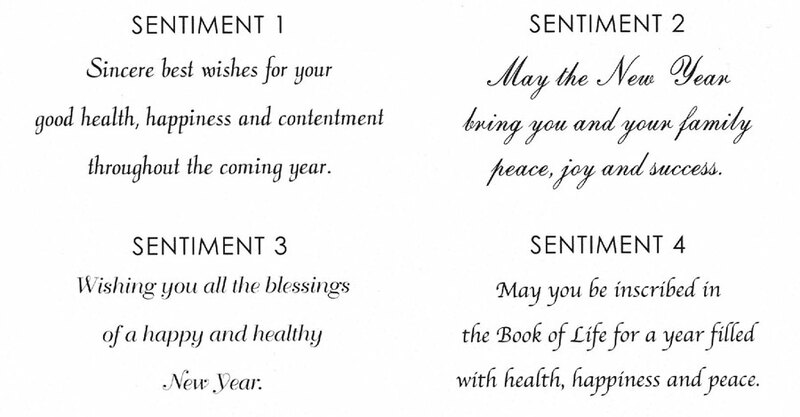 If doing a custom sentiment, we will use the typestyle as shown on the sample card. Your greeting and signature will be printed using Thermography (raised ink process) in Brown ink as shown. You can keep the sentiment shown or choose any of the standard sentiments at no additional charge. You can also create your own custom sentiment for an additional charge of $50.00. You may choose to add a Hebrew sentiment. If you choose to show a Hebrew sentiment it will appear above the English sentiment. Ecru envelopes are included in the price of the card. You can change to a Red envelope for an additional charge. Can be flat printed on the back of the envelope for an additional charge. For optional red envelopes, the return address will be in black. For ecru envelopes, the return address will be in the ink color used for the card text. (other than the standard envelope)? Do you want your return address on the envelopes? If getting printed envelopes, what ink color?